Baby Ella turned one week old this past weekend… and she had lots of visitors all weekend. Ella has many caring people in her life, and we’re all blessed to know her. 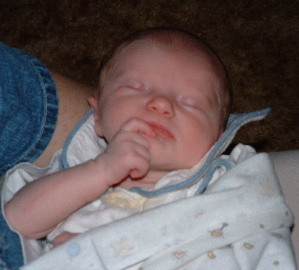 There’s more pictures of Ella here to look at… see her taking her first car ride, taking a first bath, thinking hard and looking beautiful. Well, she did it. 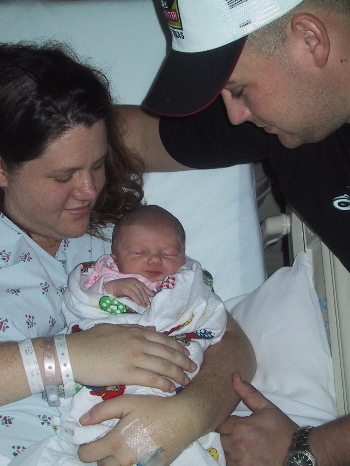 Ella Christine was born to Evan and Shadel on Saturday, March 13th, 2004 at 10:22 pm. Ella is a beautiful little baby (see all of the photos here), and very well mannered. She’s passing all of her tests with flying colors while at the hospital.Evan and Shadel are being model parents, and all of the grandparents, uncles and aunts and everyone else are very proud of them and Ella. Evan and Shadel are close to having their baby… only 9 more days until Shadel is due. Shadel is doing fine… enjoying these final few days…We’re all looking forward to March 17th.